January Block Party Link Up! We are three to four months in to our Block Party InstaBee! 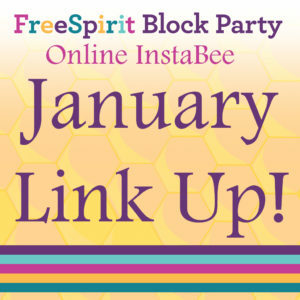 We have 6 hives buzzing, creating amazing blocks from our book the FreeSpirit Block Party! To see how everyone is progressing, we are having a link up party! Using the form below, add the photo of your favorite block you have made so far! It can be your January block, your first block, or any inbetween. Link up before January 31st, 11pm. From all of the entries, we will use a random number generator for our first giveaway. Paula of SewModernChicky has donated a $25 Gift Certificate to her online store! Thank you Paula! Visit her shop and start planning your fabric loves now. http://handmade3d.me/wp-content/uploads/2019/01/January-Link-Up.jpg 1024 1024 handmade3D http://handmade3d.me/wp-content/uploads/2018/10/rectangleLogo-300x121.png handmade3D2019-01-13 13:51:592019-01-13 13:55:34January Block Party Link Up! Sorry you are having trouble! I updated the account and it should work. If not, feel free to email me your picture directly and I will add it for you. Reply to one of the newsletters with your picture, and I’ll do it.